For many microcontroller projects requiring accurate temperature sensing the sensor of choice is the Maxim DS18B20. Although this has a specified absolute accuracy of +/- 0.5°C, it has several drawbacks, not least of which is its relatively high cost. For my prototype sensors I incorporated a TI TMP112, which is an I2C device with a minimum operating voltage of 1.4 V, making it particularly attractive for battery powered applications. 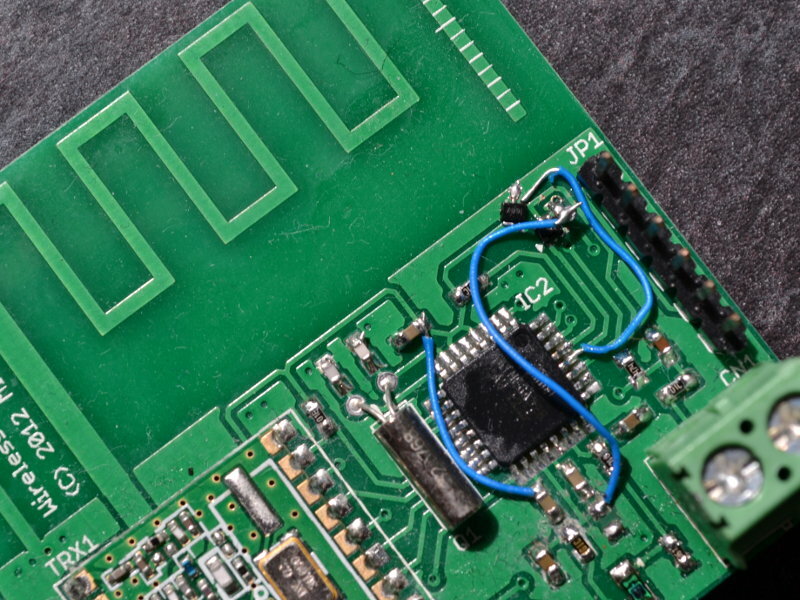 My preferred option for cost-reduction, however, has always been to use a cheap thermistor with the microcontroller’s built-in analogue to digital converter (ADC). This post discusses the evaluation of a thermistor-based technique for small embedded systems capable of achieving uncalibrated temperature accuracy to rival expensive digital sensors. An experimental comparison of various sensors over temperature is then introduced. There are a few challenges in using a thermistor well. Firstly, care must be taken to measure its resistance accurately, and secondly some characteristics of the thermistor need to be obtained, either from the datasheet or experimentally, and applied to a model in order to derive the actual temperature. The formula that is usually used for this calculation is the Steinhart-Hart equation, which is not well suited for calculation on an 8-bit micro. To solve the first problem the thermistor is used in a potential divider configuration as one might expect, but with the ADC configured to use the supply rail as its reference. This makes the ADC count dependent only on the relative resistances in the divider, and eliminates any dependency on the accuracy of the ADC’s voltage reference. Since the value of the fixed resistor remains important a 10k 0.1% tolerance part was used here. 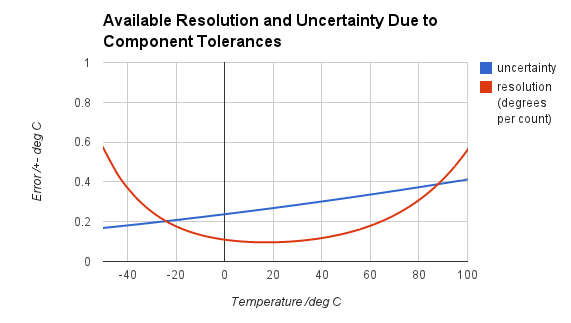 Even such tight tolerance resistors still only cost pence, so the cost advantage of the thermistor is not lost. The divider is powered from a GPIO to eliminate current sinking through it while the sensor is asleep. The second part of the problem helps drive thermistor selection, because choosing a part with reliable manufacturer-supplied Steinhart-Hart coefficients eliminates the need for calibration. A Vishay NTCS0603E3103FMT was chosen and a spreadsheet devised which calculates the thermistor resistance (Rt) and the ratio Rt/R25 value for every 16 ADC counts across the full 10-bit range. Maximum, nominal and minimum values are calculated in each case, based on quoted component tolerances. For each row the maximum, nominal and minimum temperature is then calculated using Steinhart-Hart with the coefficients provided by the manufacturer. Alternative thermistors can be evaluated by entering the R25 value and Steinhart-Hart coefficients on the “Graphs” sheet. 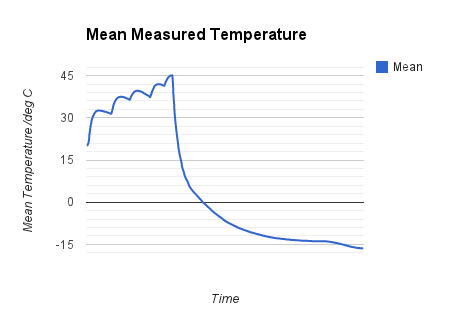 The predicted temperature spread due to component tolerance is plotted on the “Graphs” sheet and can be seen below for the Vishay thermistor and a 0.1% 10k reference. At room temperature an error of +/- 0.3°C is predicted, which is well within the desired range. /* Lookup table for thermistor ADC values / 16 (64 points for full scale). * given on the thermistor datasheet. All of the above is of course purely theoretical, so a sensor board was modified to place the thermistor directly adjacent to the TMP112, and an additional TMP102 sensor was added as shown in the photograph at the top of this article. The firmware was altered to transmit temperature measurements from each of the three sensors at 10 second intervals, then these values were logged while the board was temperature cycled in the oven and the freezer. It can be seen that the offset from mean is fairly constant for a given sensor, with the total spread being under 1 degree at steady-state. Interestingly the TMP112 was almost as far from the mean value as the thermistor, but still within its +/- 0.5°C specification. The large swing seen during periods of high rate-of-change is thought to be due to the difference in response time between the thermistor and the diode sensors used in the TMP1x2s. 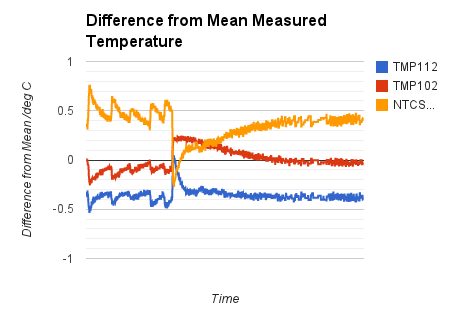 For the thermistor, the average difference from mean measured temperature is about 0.4°C; slightly worse than the predicted value. This is not unexpected since the prediction takes into account only the spread of component values, and not errors in the Steinhart-Hart coefficients, details of which were not available. The table below summarises the vital statistics for the sensors used in the experiment, with the DS18B20 included for reference. Pricing was obtained from Farnell UK on 28/4/13 and is ex-VAT. The results indicate that, using the described lookup table method, a low-cost, uncalibrated thermistor can yield an absolute accuracy similar to that of the much more expensive digital sensors. At the same time, there are no supply voltage restrictions beyond those of the microcontroller, and by using a GPIO to power the divider standby current consumption is limited to leakage and should be negligible. This entry was posted in 8-Bit, Embedded, Home Automation on April 28, 2013 by Mike. I’m planning something similar for my project. Except I’m using even cheaper thermistors and resistors (5% ones) and generating a custom LUT for each of them using curve fitting.